It seems there are many foods that benefit from 50 to 60 degrees Fahrenheit / 10 to 15 degrees Celsius storage temperature--herbs, peppers, tomatoes, etc. As it stands, I store tomatoes and some herbs on the counter, which shortens their shelf life. Is there a small home refrigerator available that will provide a suitable environment for such produce? You could try wine coolers*. Wine likes temperatures around 50F, so they should all be around the temperature you want, and the nicer ones will have accurate thermostats too. Mini-fridges could work - if their warmest temperature setting is warm enough. But be careful: they tend to have very bad circulation. On normal fridge temperature settings, a lot of them range from frozen on one end to too warm on the other end. If you set it warmer, you might end up with a range from too cold to room temperature. If all you're storing in it is roots, this is totally fine, but it could cause problems if anything is sensitive. So your mileage may vary, and it can be tough to tell without buying and trying. Most herbs also do pretty well in the refrigerator, wrapped loosely with paper towels inside an open bag. Things like basil that like warm weather do better at room temperature, with cut ends in water, like flowers. (You can also do this in the fridge, if you're having problems with them drying out too much - you'll want to cover the "bouquet" loosely with a bag still.) See How to Store Fresh Herbs for more. The things that you might want to store at intermediate temperatures are root vegetables - this is why they were traditionally stored in cellars (like wine). Potatoes, for example, have an ideal storage temperature around 45-50F. But it's not a huge concern; their storage lifetime is pretty long at room temperature. Unless you find them sprouting before you use them, there's not much to worry about! * Note that I said wine cooler not wine cellar - in general the ones marketed as cellars are more expensive, but there are ones marketed as coolers that are back down closer to the minifridge price range. Rumtscho's additional suggestion of drink refrigerators is probably good too - though quickly searching, I didn't find ones that were any cheaper than the cheap wine coolers. Like many Canadians I have a "beer fridge" in the basement. In this case it's an ancient fridge that once belonged to a relative. I've turned it up as warm as it can go and it makes a great "root cellar" for carrots, beets, and the like from my Community Support Agriculture winter program. However it is significantly dryer than the typical damp earth root cellar, so I have to keep all the produce in plastic bags in there. (Anything not in a bag becomes wizened very quickly.) They definitely keep better there than at room temperature in the kitchen, or in the main fridge upstairs which is set to fridge temperature. I took an old refrigerator and placed a wine-making thermostat (with sensor mounted inside on top) which keeps the temperature around 60 to 62 degrees. Then a small computer fan was added by mounting it inside on an angle. This moves the air around throughout the whole interior. For power I used a small plug-in type transformer which satisfied the fan. This way, all the food, etc. remains fresh for a much longer time. I keep my medicine, vitamins, spices in there too because it's that elusive 'Cool, Dry and Dark' place. The freezer area is now warmer than a regular refrigerator, yet it's a great temperature for beer. On the outside is a label which warns all that this not a freezer, or even a refrigerator. Yes, they exist. They are called "drink refrigerator". 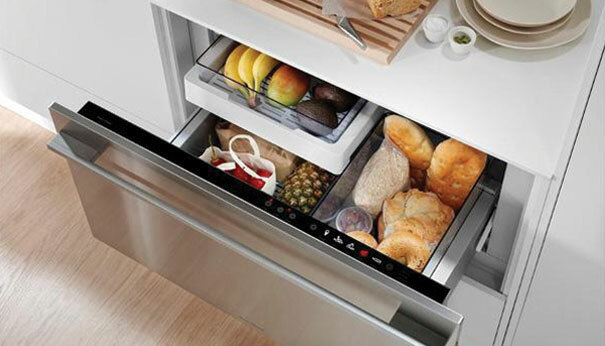 Unlike a normal fridge, they don't have a freezer compartment, cheese compartment, etc. They are supposed to be used by kiosks who sell cooled soft drinks, and normally are regulated at around 15 Celsius, which is actually a bit better for some kinds of produce (e.g. tomatoes, tropical fruit) and not that bad for lettuce and such. But as far as I can remember, you can regulate their temperature within some interval, and getting them down to 10 Celsius (50 F) does not sound unreasonable, if that's what you want. This sounds very much like the function of the Kimchi refrigerator, a type of refrigerator that typically features multiple compartments and sometimes has separate controls to manage each compartment's temperature separately. These are obviously more popular in the Korean market than anywhere else, but there are some companies that sell them for people outside Korea. It might be a clever solution if you can find one that meets your needs. Rather than spend a lot of money on devices marketed as wine cellars or similar (which are just plain regular refrigerators, perhaps with a glass door or differing aesthetic treatment and a higher price tag), you might wish to purchase small chest freezer and an aftermarket temperature controller, with a temperature probe that goes into the freezer cavity. While focused on home brewing beer, The Barley Blog explains it in detail. The device essentially overrides the freezer’s own cooling mechanism by cutting power to the appliance when the desired temperature is attained. All you have to do is plug the freezer into the Johnson Controls and then plug the regulator into a suitable power supply. It does seem that such controllers are available through Amazon, for example. (I wanted to be sure this idea is practical). Not the answer you're looking for? Browse other questions tagged storage-method food-preservation refrigerator or ask your own question. Does a colder refrigerator keep things fresh longer? How long do refrigerator pickles keep? Why does water leak from a refrigerator?